"If there was a shining candidate for hard rock album of the year, Jono's "Life" is arguably it. Grab "Life" by the balls and take it"
"Rich and multi-faceted, the JONO style asserts itself here with real certainty. The ambitious recipe includes a strong sense for melodies, a powerful sound mixed with progressive elements, sometimes symphonic, but always modern and dynamic, and a good dose of know-how. With this album the Jono definitely open the way to the deserved success! (...). "Life" is a work that can attract lovers of different genres and musical styles, thanks to the captivating melodic lines that can magnify the listener and capture the absolute attention. There are slices of QUEEN, KANSAS and even DREAM THEATER in the sound of Swedish outfit JONO. Symphonic and quite progressive rock with quite a portion of melodic rock, too. An album not getting boring whatsoever. The songs, rocking like “Crown“ or emotional and rather slow like “The March“, are quite versatile and nothing but absolutely exciting. JONO is a unique band all the way through. (READ MORE). "DownSide", "No Return" and "To Be Near You" are small melodic prog rock masterpieces, "pompously" theatrical and dramatic, which leave a good mark and certify the value in terms of a band largely above the average." "10 incredibly dynamic, and at the same time melodious and very recognizable songs, among which there is virtually no single weaker number. (...) rock songs filled with instrumental pathos and amazing singing". Melodic rock with symphonic and progressive elements. Wow! Here's a real music explosion for Christmas! 7/10 points. 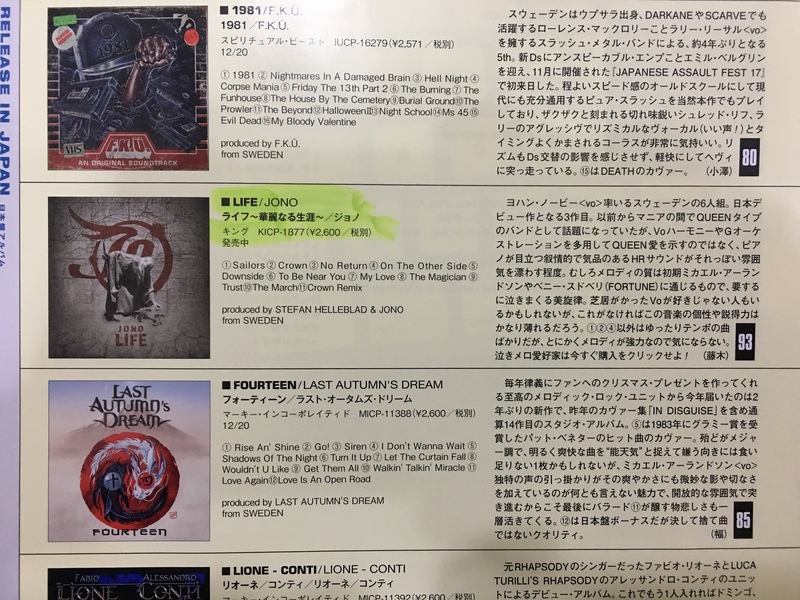 "‘Life’ is a colourful and very entertaining melodic and progressive rock CD recorded by crafty musicians and with overall quite outstanding songs as well." 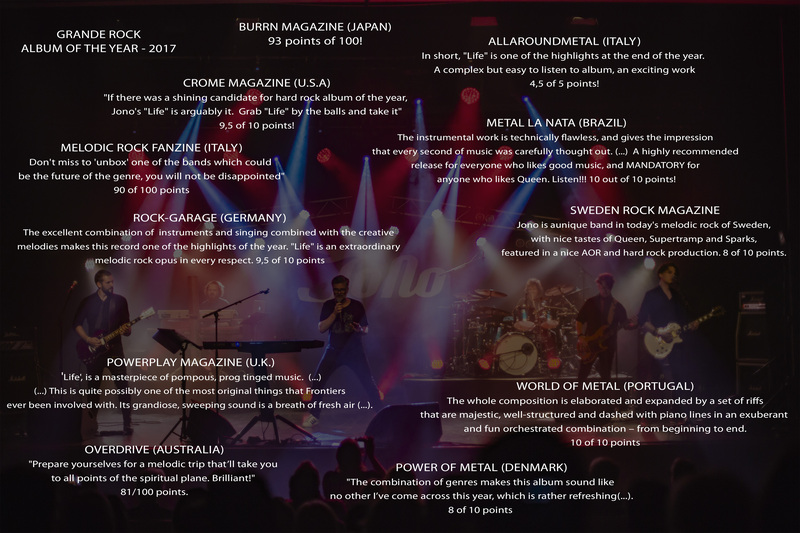 "Jono is aunique band in today's melodic rock of Sweden, with nice features of Queen, Supertramp and Sparks, featured in a nice AOR and hard rock production. 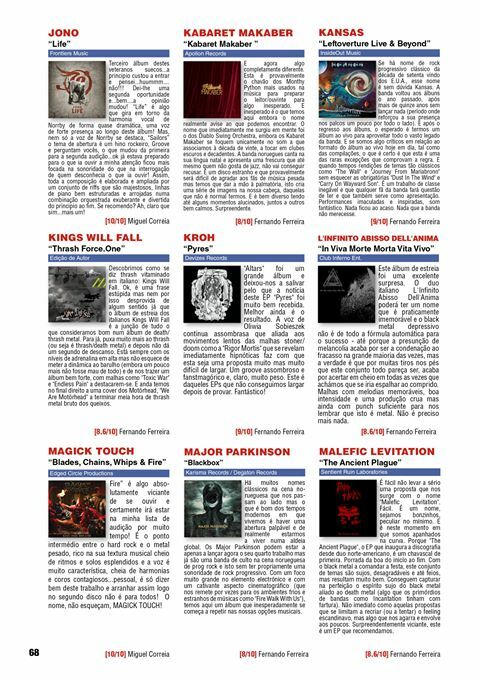 "This sumptuous and magniloquent sound, often orchestral and dramatic, can be associated with a number of names: Queen primaraly, but also their modern alter egos, The Darkness, Muse, Dreamtheater ..."
(...) don't miss to 'unbox' one of the bands which could be the future of the genre, you will not be disappointed". Other than superlatives, there is nothing else to be said about it; passionate, explosive, dramatic and performed at highest industry standards, radiating emotion and solemnness from start to finish. (...) There are many layers to be heard and enjoyed, making this album a particularly exquisite pleasure for fans of the genre. (...) you feel that you hear something extraordinarily bombastic, that strains the bellows to burst and forces the heart to move from the body to the universe itself. (... The music) generates moments of almost unbearable inner tension, but soon changes into spiritual nirvana and delusional blissful listening pleasure. My friends, this disc has no negative aspects. A highly recommended release for everyone who likes good music, and MANDATORY for anyone who likes Queen. Listen!!! 'Life' is another complete success for the band. They continue to mature with each release, and now with a sound very much of their own, which is quite refreshing these days as just too many bands stick to a tried/tired (you make your mind up) and safe formula. "Life" is a surprising work that revived the lost musical Metal Metal genre (...). "The combination of genres makes this album sound like no other I’ve come across this year, which is rather refreshing(...). A fine album and pleasant surprise to end the year!" "Norrby’s vocals are definitely coming from the Freddie Mercury playbook, and they are what really sets this album apart, especially when the huge backing vocals kick in. The musicianship is just as creative, more than doing justice to these compositions.
" ... the whole composition is elaborated and expanded by a set of riffs that are majestic, well-structured and dashed with piano lines in an exuberant and fun orchestrated combination – from beginning to end." Top ten albums of the year (2017). #7th place: "LIFE"
"From the inaugural "Sailors" to the hectic, melancholic epistle of "The March", as simple and straightforward as Jono's musical formula, it's just as addictive. " "Jono found the perfect balance between the previous albums (which also are real jewels) and they entirely take on a theatrical and grandiloquent personality. They deliver "Life" – which is their best album, absolutely superb(…). I don’t know what’s in the water in Gotland, Sweden but it’s just astonishing, to put things mildly, how these guys manages to create masterpiece after masterpiece – this is the third in a row. Because simply put, there’s nothing, not one tiny little thing to complain about here. (...) This could very well be the album of the year! "The drama begins with Norrby's power, strength, control, and emotion. (...) Then his vocal presence is enlarged and embellished by a wall of twin guitar riffage, fiery and soaring solos, light and lilting piano lines, and an enormous and bold rhythm section for a big beat and groove. (...) All these things come together in elaborate and epic ways. ."
Excellent - 5 of 5 points. "(...they) amazes everyone with a record that no one has ever expected to hear in 2017." "... Truly all songs are adequate – they are pieces of superb genre transcending art work". 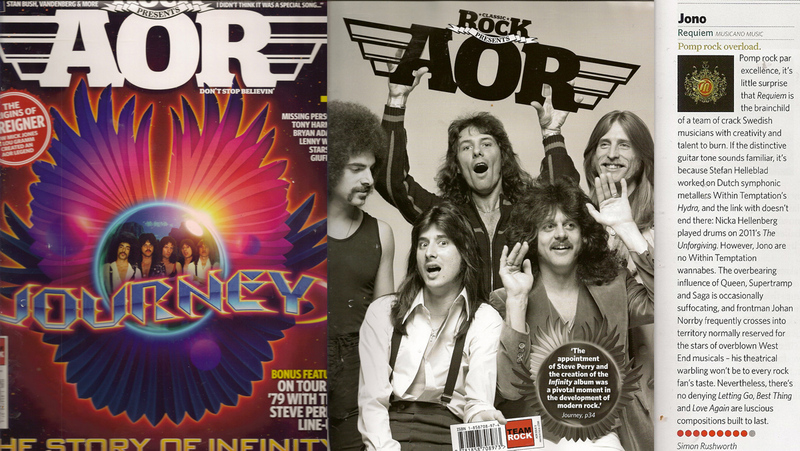 "Prepare yourselves for a melodic trip that’ll take you to all points of the spiritual plane. Brilliant!" "(...) They succeed in packing prominently written and richly-tuned songs on one another, which are founded on dazzling performances. " "Life is an excellent bombastic record that has a pomposity that is constantly backed up by the virtuoso playing involved." "Life" is an album well written, played and produced, which will be loved by the accustomed to the genre.(...) The greatest merit of "Life" is that of creating, in every single piece, atmospheres that are clearly inspired by Queen (...). 7/10 points. The interplay between the musicians is particularly noteworthy, because the arrangements of the songs are not exactly a simple fare to call. (...) Altogether somehow complex, in a way progressive and yet the songs come structured and technically clean produced. There are no beginners at work. (...) JONO also skillfully makes orchestral and occasionally symphonic moves, as I said, on a musically very high level. "The listener is taken on a ten song journey that when the album finishes you feel like it was a very satisfying experience that you were lucky to be a part of. (...) A lot of bands try to make an album like this, but very few succeed. " 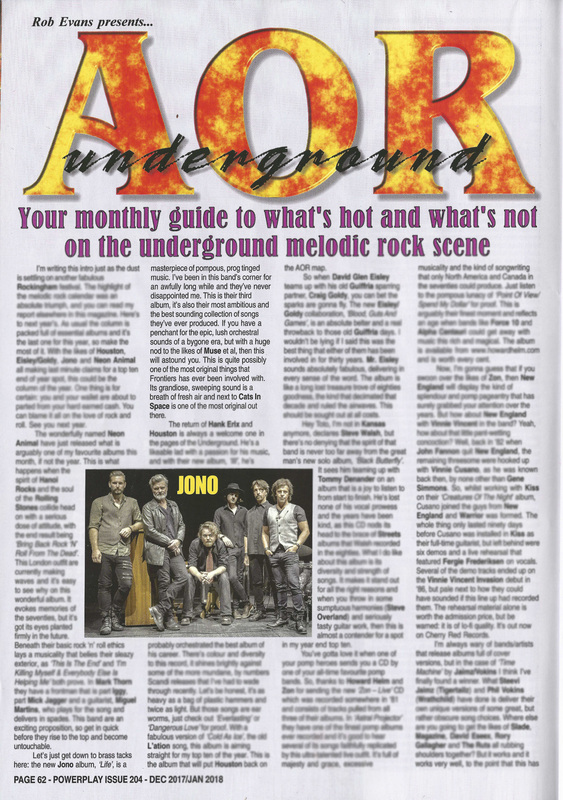 "This album is definitely a continuation of those two albums but there is definitely a feeling that Jono are beginning to uncover some new ground for themselves (...)." The new Jono album, 'Life', is a masterpiece of pompous, prog tinged music. (...) it's their best sounding collection of songs they've ever produced. (...) This is quite possibly one of the most original things that Frontiers ever been involved with. (Its grandiose, sweeping sound is a breath of fresh air (...). "(...)Spectacular Jono , with spectacular 'Life', and we are just in the beginning of their music career"
Life is consistently extraordinary on almost every track. The excellent combination of instruments and singers combined with the creative melodies makes this record one of the highlights of the year. (...) "Life" is an extraordinary melodic rock opus in every respect. Jono has undoubtedly their own character, curious and interesting. The Style moves between melodic, bombastic Rock, progressive and symphonic. We hope that this project finally will have the international impact it deserves (...). "(...) here we are presented by rock songs, definitely hard, certainly much more symphonic and arranged than the norm. Musically, this is really top quality and vocal ... This is truly top level for every music fan who is open to broadening his/hers horizons. Jono are not strangers to anything. It feels good to feel such a free group of musicians, free to play the music they like to do, free to take us with them into their universe (...). The Swedes' new album hits a bingo and may broaden their horizons. This new record could become the definitive opportunity for Jono to be known by the large metal audience and be so consecrated as one of the best emerging formations of the progressive genre.
" (...) their music is intriguing and original, the right combination of quality to let us inquire with curiosity about their future." Life is an album with solid rock as a basis combined with different influences. The songs are all solid compositions. "The album as a whole was a pleasurable listening experience. It pulses with every bit of the band’s personality (...). It will appeal most to music fans is for those connoisseurs who have broad tastes, and who like passion and depth in their music. Though sometimes idiosyncratic, it is rich with texture and surrounds you in warmth. "Jono has created a masterful album called Life that to my ears takes the best of Muse and Queen and makes it even better! (...) Highly recommended. The overall impression is that here is a band at the very top of their game. (...) This is high class melodic rock that in some ways contains elements of the Seventies, yet is very much of the present day. "The gentlemen of JONO definitely know what they are doing here. The ten new tracks are relatively bulky, emphasize in their dramaturgy but complete the musical character and really submit fully to the given concept. Imagine the Trans-Siberian Orchestra would take out the ornament and move towards hard rock and you get an idea of ​​what happens on "Life". 7,5 points out of 10. Aside from the great performances, the songwriting is consistent, creative and artistic in any way. It’s not that easy to find such great music in our time; music that has something of the charm that mostly rock albums in the 70s/80s had! All in all, “Silence” is a splendid album… among the top rock albums of 2015! "(...) melodic and harmonious, never predictable, with a final high emotional impact. (...) 'Your Bread' seems prog metal but then reveals a formula that captures the epic power metal, mixing speed, Kansas-like powerful melodies and vocal harmonies (...), all together in a unique choral breath. Jono is an independent band incredibly still not signed (…), but (they) demonstrate that you can do very worthy things without a company backup. Having great songs is what really matters. "Silence" is a (…)strong candidate for album of the year." 9/10. Throughout, the production of the album is big and fat befitting of the music contained within. (...) A little early in the year to say so, but this album will take some beating if it's not to make my top spot....... Pomp Rock lives! Run for the hills!" The cover is beautiful with, a booklet on glossy paper with beautiful pictures of the band during the recording (…). The group of the island of Gotland has truly established their style and there is an ultimate perfection in the compositions and melodies. The production is perfect and the musicians are all impressive. (…) The singer Johan Norrby carries an impressive vocal performance (…) You really feel that Jono is the most solid group. They (…) perform faultlessly with this second album that proves different, but just as fantastic as "Requiem" . A Must! "The sound can be classified as a progressive mix of Queen, Supertramp, Kansas and Journey. (...). Last year they released "Silence", which has this refreshing obliqueness that got me settled right after embarking the orchestra bustle inthe first song of the album, "Man of Misery". Ett gäng musiker som enligt mig är i världsklass. (…)Detta är ett nästintill fulländat mästerverk som dessutom innehåller årets hittills bästa låt, alla kategorier, nämligen "Wasting Time". Av: Kenneth Gustavsson för Rocknytt. - Yes? Then, here’s your album of the year! Feel free to fly away with JONO and their heavenly resilient melodies. (…) Elated, graceful, fast, gracefully, sweet and charming. Ohooooou. JONO." 8,5/10. "(...) I could mention all tracks on "Silence" as highlights, because this record is pure gold. Yes, it's close to perfection. Even the cover artwork is magnificent. JONO is the real deal, the most talented Rock band emerged in the last fifteen years (and more). Like I said in the previous album review, get this album at any price. " "(…) A truly masterful album. (… We) can only applaud and congratulate a performance that only a few combos manage nowadays. JONO preserve their identity and are welcome to be called unique. (…) JONO is a rare species in today's music world: a band that does not try to copy and thus to succeed. (…) "Silence" is full of self-confidence and great musicality – here music is art again!" 10 out of 10! A great album (…) absolutely recommended for all lovers of progressive rock, hard rock, AOR and all its derivatives, with an extraordinary voice of Johan Norrby. (Silence is …) to be considered one of the albums of the year. READ MORE (in spanish/en espanol). “With its rich, effective blend of muscle and melody and a big, luxurious production befitting such bombastic music, this is an album very much for today.
" (...) ett band med egen identitet, inte minst för vokalisten Johan Norrby som sjunger minst lika bra live. In my life - en sådan där glädjespridare är naturligtvis en låt som alla behöver. okej om någon som hört Bohemian Rhapsody så är spåret Opus definitivt att rekommendera. (…)Låt fantasin flöda och vi har Jono!" "... light, epic and a with stunning lyricism, reminding in many aspect of the band Queen (...).The music is symphonic, such as in Man of Misery, Wasting Time and Can We Make It (...). Turn Around is a very pretty ballad, where JONO approaches the side of pop music, not bad at all. Your Bread, The One to Blame with its catchy choruses and Clear - which skillfully combines the hard and progressive rock. 4,5 of 5! "Ten dynamic rock songs, blending all of the usual Jono traits, rich arrangements, catchy melodies and an overwhelming sense that you're listening to a rock musical in the theatre. (...) It all adds up to a very interesting mix. If you like your music with a theatrical flourish, then this is worth checking out." 8/10 points. Issue #181, Nov 2015. "Silence" är som sagt fylld med bra låtar (...). Jono är ett mycket kompetent band med grymma musiker (...). Som helhet är "Silence" ett strå vassare än debuten med lite bättre låtmaterial och lite bättre produktion. Detta är helt klart en platta att kolla in. 9/10 poäng. ”(…) a Swedish quintet of great talent, offering a sound similar to masters such as Kansas, Queen, Toto (…), with a very personal mixed style, with delicate textures, melodic prog, hard rock and pomp. "Epic elements are present in the music at every step: from complex arrangements by multi-store vocal harmonies, to the incredibly pompous tone of all (!) tracks on the disc. And its catchy melodies is probably actually the strongest part of Jono's music. Just listen to this album for two-three times, I could easily hum the melodies of each song. (…) I have to admit that the album "Silence" is one of the most pleasant surprises of this year. (…) I liked it from the first, and I loved it from the second listening. A good start of the week is a morning listen to the energetic, extremely positively tuned Jono music. With this music in your ears you want to live!" “Their music is epic, with a retro flavor, but electrifying vivid. (…) Silence is the essence of what this group is capable of creating: elegant arrangements, great showmanship, fluid instrumentation and powerful sound – each of these element lifting the music to new heights. Very well structured, lovely vocals and catchy tunes, which is carried by a band of frontline musicians (…). Singer Johan Norrby is not silent, but very powerful! With Silence, Jono delivers rock with class and strong songs. JONO are rather easy to hook up with. (…) There is a fine measure of diversity, between profound rockers such as "Your Bread" and "In My Life" to the mega powerful moments of Rock truth with "Turn Around" and "Opus". Excellent – 8 out of 10 points. I have been mesmerized by this band's ability to constantly create high quality melodically driven compositions boosted by equally skilled musicianship. (…) it’s some of the quiet moments that make this album a true gem for fans of progressively inclined rock music. I'm talking about tracks like magnificent Clear and the seven minute Opus, which is a multi-suite in the great tradition of Bohemian Rhapsody. It took me quite a few spins in order to uncover the magic behind these two compositions so don't be impatient if you don't happen to enjoy them at first. Four stars...Excellent addiction to any progressive rock collection." This album is a clear contender for the Album Of The Year position, hell, it just might be the album of the year. I can’t think of one tiny bit of criticism to add to this review. This is not a tribute band of Queen or other artists mentioned, but a group that continues to strive for making music in these genres. (...)Highly recommended! "(...) and every song is a little gem of rare beauty. (...) Excellent work, elegant from all points of views. Jono really deserve all your attention." "8 OUT OF 10 (...) They share the obsessive’s ear for fine textural detail, creating meticulously crafted music with a crisp, clear sound. " "I present to you one of the nicest and warmest surprises to come from a Swedish band in quite some time, at least for those of you who are into soft AOR. (…)This album oozes of professionalism and has many influences from QUEEN and SPARKS, as well as Dutch pride VALENSIA. This includes the grandness in the arrangements and highly impressive harmony vocals "
"(…)We have an album full of preposterously camped-up, theatrical rock, tempered now and then by some finely tuned AOR sensibilities. If I also tell you that at various points I thought of Freddie Mercury and Queen, Abba, Muse and Sparks, you should be in no doubt about the musical terrain over which Jono prance and stomp. (…)Requiem is a very competently crafted and delivered set of tracks. " 10 out of 10. "A five man Rock band from Gotland, Sweden who have a quirky kinda style that remind me of Sparks, Mika & Queen and many others including Supertramp and dare I say it, The Darkness. (...) Within Temptation’ is a strong element in this band since Stefan Helleblad is their guitarist too with drummer Nicka Hellenberg taking care of their album ‘The Unforgiving’. Lead Vocalist & Keyboardist, Johan Norrby has a real Freddie Mercury flavour to his voice that has a real syrupy richness too.(...) Friggin’ Outstanding!" "..jag kan inte skatta mig lycklig nog över att få ha hört detta album som förmodligen skulle ha gått alla förbi i dagens taskiga musikklimat!(...) Det är lätt att konstatera att för att kunna skriva och framföra denna typ av musik krävs det kompetens och mod. (...) Detta är ett band som gör vad de vill för att de kan.(...) Det är så infernaliskt bra så om det så är det sista man hör i detta jordelivet så knallar man i alla fall vidare med ett fett nöjt leende!" BETYG 9 AV 10!
" 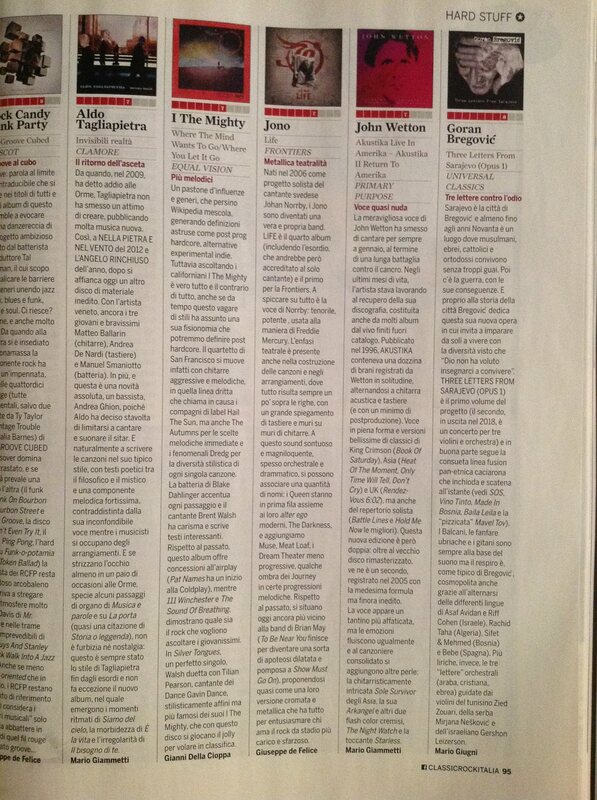 ..Requiem is an outstanding job, bombastic, symphonic and very melodic. (…) Requiem has a thousand influences, lots of references, but the band knows how to be very original and self-confident.
" ... One of the coolest Swedish news for a long time is a fact (...) Already in the first song, 'I was the one' You start to realize that this is something extra (...). "IWhat a surprise (...) this band ,originally from Sweden, with their album "Requiem" that lead me to think of Queen, Toto, Kansas (...) In short, it's a debut that is priceless"
"I am in ecstasy. This is the trance-like state you'll be into after listening (...) Seriously, get this album at any price. "Requiem" is a perfect mix of melodic progressive rock, melodic rock and elaborated rock & pop delivered with a freshness and originality rarely seen in the music business of today. " "The nine songs on Requiem display a fine combination of progressive rock, rock and pop. All of them are very much worth listening to and are sometimes related to the music which bands such as Supertramp, Toto, The Sparks and Muse have released on their albums "
"I really liked the album (...), it is undeniable that the attention to detail, the sounds, the arrangements they make creates a product written with passion and assembled with skills." "If I say, "Watch out! Masterpiece! maybe you will take the time to read this column? Jono is a Swedish band that offers a very cleverly mix of progressive rock influences. A group that will, in my humble opinion, know a resounding success! (...) The only complaint is that it only lasts 40 minutes. For the rest, "Requiem" is a total success"
("(...) beauty, with sweeping arrangements perfectly blended into a product of, again, great quality. A quality not only demonstrated by the musicians, but the undeniable imagination and careful work on the details (...). We are facied with fresh rock, optimistic, direct, natural and immediate." "(…) när slagdängan The flyer avrundar kvällen är jag och den mycket Sagakunniga pustervikspubliken de första att svära på att vi är på plats även nästa gång gruppen gästar våra breddgrader. Och då får gärna finfina Jono från Gotland uppträda som förband igen. För där har vi en grupp som förstått hur man tar intryck från ovan nämnda band utan att försöka apa efter." "I've experienced a lot of music, but nothing - absolutely nothing - is even close to this! I had goosebumps from the first second of the concert to the last two hours later (...). 10/10." "(...) We’d love to see excellent Jono as opening act (for SAGA) again. Here's a band who knows how to be influenced without copying (…)"